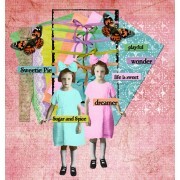 This is a digital kit that has everything you need to make some digital ATCs which can then be printed or shared. This kit includes all of the items shown in the preview. Items shown are a sample of what a finished ATC may look like. ..